I’ve learned a lot of new skills in the kitchen since we came to PNG over a year ago, but pasteurizing milk at home is the latest. Neither Brian nor I are big milk drinkers, but we were still disappointed when we learned how rare fresh milk is in PNG. Most people use powdered milk or boxed UHT milk (the kind that can sit on a shelf for months and you only need to refrigerate it after it is opened.) But here in Ukarumpa we are a little spoiled, because there is a family that owns a Holstein cow, and their teenage sons deliver milk as a way to earn extra money. We pay $3 a week to have two liters delivered. Just a few weeks ago, I decided to try pasteurizing the milk, because it tended to go off on the third or forth day. It was successful, and our milk lasts longer and tastes a little more like store-bought milk back home. Fill the bottom of a double boiler with an inch or two of water (make sure the water does not touch the bottom of the pot or bowl you set on top). 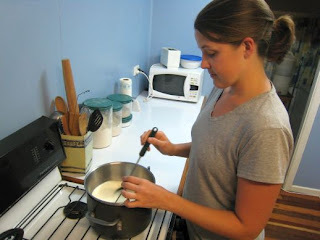 Pour milk into the top of the double boiler. Before you begin, fill a large bowl or a sink with ice water. Over medium heat, stir milk and slowly bring it up to 161°F for 15 seconds. Immediately remove the bowl or pot with the milk and place in the ice water, stirring so that it cools down quickly. After milk has cooled substantially (to below 90° or so), I usually cover the bowl with plastic wrap and put it in the fridge to continue cooling. Later I skim the film off the top and pour it into a pitcher.